North Korean propaganda has been unusually fixated on praising the country’s education sector. Why? When North Korea’s propaganda media outlets increase coverage of a certain topic, it often points to an ulterior motive. The latest example is North Korea’s education sector. In recent months, several major propaganda outlets have intensively increased coverage of this industry in North Korea. What is notable this time is that Pyongyang appears to be eager to promote how “advanced” and “innovative” it is in terms of developing its education sector instead of repeating more routine propaganda messages. DPRK Today, one of the most active propaganda websites, for instance, said in early March that a student from Pyongyang University of Education had developed at least four educational programs using virtual reality technology within a year. North Korea’s state-run Rodong Sinmun newspaper also reported in December last year that the country had introduced VR technology in its education sector. According to the paper, the country has developed a virtual examination experience, a virtual classroom, and an intelligent education system using robots. Rodong Sinmun added that universities across the country were busy and eager to develop new educational methods. Universities across North Korea have been “engulfed by the enthusiasm” to constantly create new teaching methods by introducing VR technology and the project to supply “excellent” teaching methods has assumed an important place in the education sector, the paper noted. 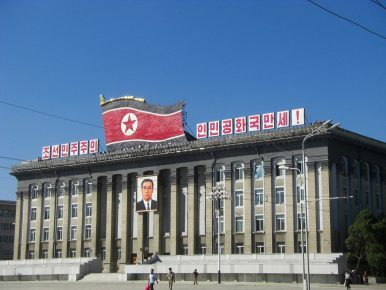 Another propaganda website, Arirang-Meari, also published a total of 10 reports between March 1 and March 29 promoting North Korea’s achievements in the education sector, which appears to be more than usual. This raises a question: Why North Korea is so eager to promote its education sector? There is obviously no clear answer unless Pyongyang comes out to say what’s behind its move. But it is still possible to take a guess. One clue is North Korea’s latest step to increase ties with Vietnam. It has been widely reported by international media that Pyongyang hopes to attract more tourists from Vietnam after the summit between the North and the United States. It is understandable to see North Korea’s interest in Vietnamese tourists, since the tourism sector is one of the few routes for Pyongyang to earn foreign money amid tight international sanctions. Currently, the North’s tourism industry still heavily depends on China. But the tourism sector might not be the only channel where North Korea hopes to make foreign money. In the latest meeting between officials from North Korea and Vietnam, the two sides agreed to bolster cooperation in various fields between two nations – and they particularly stressed the education field. Although North Korea has kept itself isolated from the rest of the world for a long time, it still accepts international students in many ways. Most people head there for Korean language and cultural courses, but there are also some who earn full degrees. Studying in North Korea means an opportunity to experience one of the world’s most “secretive” countries, but it costs money. There are many Korean language and culture programs up and running managed by foreign tourism agencies, and they are easy to find online. Tongil Tours, for example, charges students 2,800 euros ($3,100) for a program that lasts about a month in Pyongyang. Meanwhile, one report suggested that it costs about $18,000 for foreign students to spend a year at a graduate school in North Korea. That includes $3,500 of tuition for one semester. The figures might not look high for those who are from affluent countries, but they are for North Korea. In a country where all educational institutions are controlled by the government, it is an easy guess that those institutions are a pipeline for Pyongyang to pump foreign money into the country. Given all this, it is little wonder why North Korea is so busy promoting its education sector to foreigners.